For starters, marquise is pronounced “mahr-keez.” This marquise diamond was first designed in the 18th century in France and if the legend is correct, it was named after the Marquise de Pompadour (a.k.a. Madame de Pompadour). She was one of King Louis XV’s favorite mistresses and the marquise diamond’s elongated shape with rounded sides and pointed ends resembled her mouth. The marquise cut diamond is also known as a “navette,” which in Old French means, “little ship” or “boat shaped” because its shaped like that of a racing yacht’s hull (sometimes it’s also considered football shaped). As such, early 20th Century Edwardians favored the marquise cut since Britain’s King Edward VII and his moneyed contemporaries’ favorite hobby was sailing. Marquise cut diamonds were also quite popular during the 1970s for engagement rings. But, by the 21st Century brilliant-cut and square-shaped diamonds became the favorites for diamond engagement rings. However, the marquise diamond still has many admirers, and for good reason. Due to its shape, a marquise cut diamond looks larger in a ring setting, than a round cut diamond of the exact same carat weight. 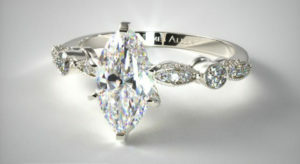 Many women also like the way a marquise diamond ring makes their fingers look, longer and more slender. Belly: The middle of the diamond where the sides are curved out the most. This is where the width of the marquise diamond is measured and why the belly is so important. Wing: The curved area of the diamond, the part between the belly and the point. Point: The shape with pointed ends of the diamond, where the curved sides meet forming a point. Keel Line: The underside of a fancy cut diamond. This is where the facets of the pavilion meet. 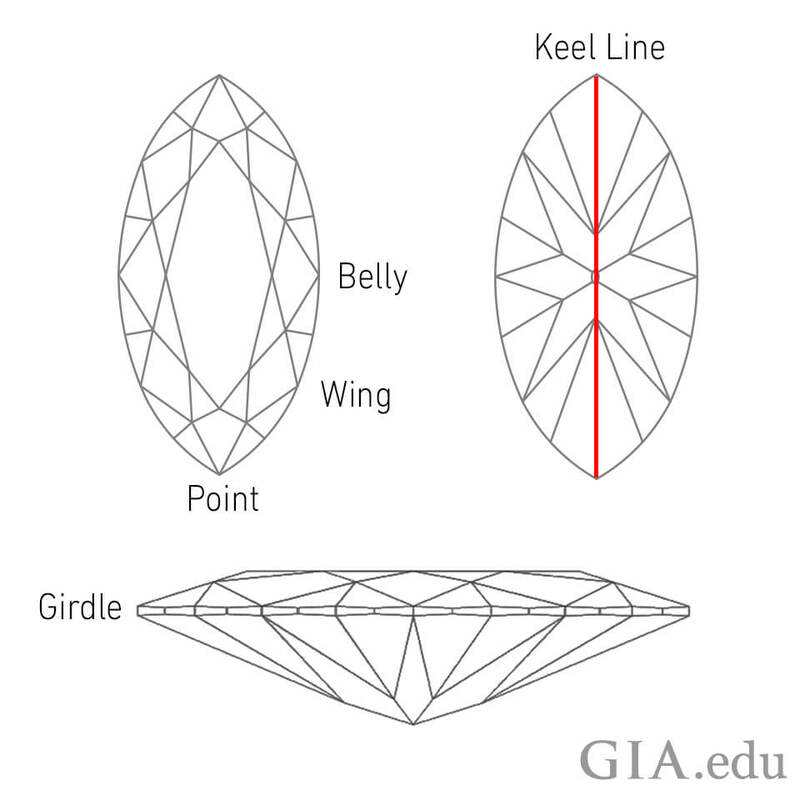 The keel line is the length of the diamond and it may include or pass through a culet facet located in the center. Girdle: Where the top (or crown) of the diamond meets the pavilion (or facets) on the bottom. The girdle is the perimeter of the diamond. The girdle is the edge where the diamond will be set. When the girdle is thick enough there is less likelihood that the diamond will be damaged when placed in the setting. The thickness of the girdle is assessed by carefully examining all areas of the section where the top of the diamond joins the bottom. In a brilliant cut diamond, the girdle is scalloped with “hills” and “valleys” where the upper half facets met the lower half facets. If the girdle is too thick it makes for a heavier diamond than it looks face up, whereas a girdle that is too thin can raise the risk of chipping. Although girdle thickness is evaluated the same manner in fancy-shaped diamonds as in round shaped diamonds, the marquise cut diamond requires certain allowances. 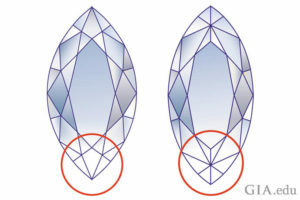 The most fragile areas of a marquis diamond would be its two points; therefore it’s okay for the diamond to have slightly more girdle thickness at the points. Because the pointed ends of a marquise diamond are susceptible to chipping or breakage, some diamond cutters deliberately cut French tips make them sturdier. Rather than cut a large bezel facet on each point, they use a modified star on the upper girdle facets. When you measure the point-to-point length of a diamond and compare that to its belly width you find the length-to-width ratio of the diamond. Basically speaking, a marquise diamond’s length commonly measures about double its width, making its length-to-width ratio 2:1. Do marquise cut diamonds have a length-to-width ratio that experts consider ideal? Most marquise cut diamonds that have been submitted to the GIA lab have length-to-width ratios in the range of 1.6:1 to 2.2:1. 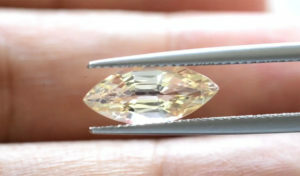 With regard to marquise diamonds that are longer, cutters find it very difficult faceting the diamonds in such a way that their face-up appearance is as bright and attractive as shorter cut diamonds. 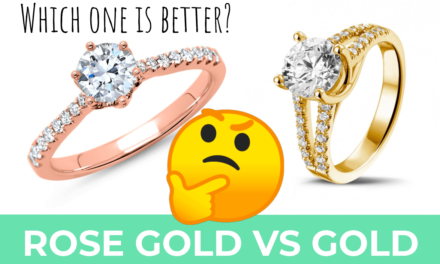 On the other hand, a really short marquise cut may look “stunted.” At the end of the day, what matters is the diamond that appeals most to you, the one you can’t live without. Symmetry is the key to good design when it comes to marquise engagement rings. Another key factor is what’s called “shape appeal” (see examples below). The shape and symmetry of a marquise diamond are major factors in how visually appealing the diamond is overall. 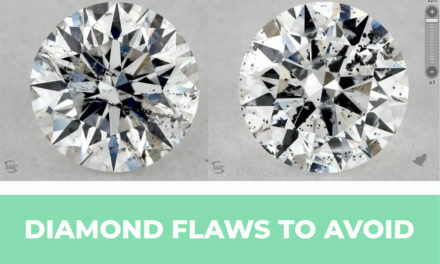 GIA uses visual observations to assess a diamond’s symmetry and will produce a grading report ranging from Poor to Excellent on a 5-point scale. The curve of the diamond’s wings should be symmetrical. The wings should display the same degree of curve. Imagine a horizontal line drawn across the belly of the diamond and look to see if the outline of both halves is symmetrical and whether they are equal lengths. Neither half should be shorter or longer than the other half. Symmetrical facets also determine how beautifully cut a diamond is. Imagine a line drawn vertically down the diamond’s length and look at the facets on both sides. They should be the same size and shape as well as be in the same positions along the wings. Next, imagine a horizontal line drawn across the central area, and see whether the facets on the top and bottom are symmetrical as well. The more symmetry the facets display, the more beautiful and desirable the diamond. Symmetry is not enough when it comes to a marquise diamond; it needs to be elegant and refined. Shape appeal is judged differently than symmetry. 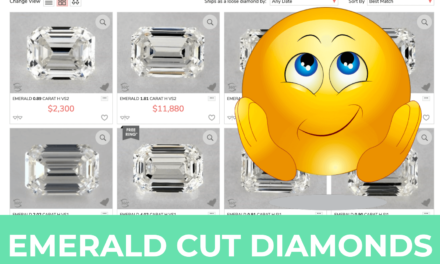 When expert jewelers assess shape appeal, they look at the diamond’s overall appearance as it compares to other diamonds of the same cut and shape. Bulged wings: The wings have a plumper look, with more than the usual amount of curve. Flat wings: The wings have a flatter appearance with less than the usual amount of curve. Undefined points: Either one or both of the ends are a bit rounded rather than pointed. Uneven wings: One or more of the wings have more curve or less curve than the others. If you compare the marquise diamond on the left to the three diamonds on the right you can notice how subtle differences in shape will affect the overall appeal of the diamond. Also, look at the bow-tie effect in the central area of the two diamonds on the left. Looking at a brilliant cut marquise diamond face-up, you can often see a dark shadow in the center that looks somewhat like a bow tie. These can range in color from light gray to black. This is called “the bow-tie effect” and the darker and wider the bow tie, the more it will adversely affect the overall appearance of the diamond. Marquise cut diamonds will usually display the bow-tie effect to some degree since those that do not display a bow tie sparkle less and tend to be rather dull. A slightly noticeable bow tie can be attractive in a marquise cut, but some bow ties are so noticeable that they are a distraction. Diamonds with either very deep or very shallow pavilions commonly have bow ties. Diamonds with some variations in faceting and moderately deep pavilions will display less bow-tie effect. Imagine yourself as a diamond grader looking for how much bow-tie effect a marquise diamond has: You would view the diamond face-up, with no magnification, at a normal distance and with normal lighting, just as if the diamond was in a ring on your finger. The facets of a diamond are like a grouping of mirrors that gather light from all around and reflect it back to your eyes. Looking at the diamond, your head and shoulders can’t help but block some of the light coming through. This causes a dark contrast, which is the bow-tie effect. How dark (gray to black) and how pronounced the bow tie is can vary in diamonds, depending on the proportions and your viewing distance.